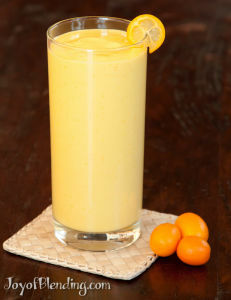 I always thought kumquats would be too sour to put in a smoothie, but earlier this month I saw a kumquat smoothie over on Serious Eats, so I decided to try making one, and it was great. This recipe reminds me of my Orange Julius recipe, in that it is nice and creamy and citrusy, but the flavor is pretty different. Mango and honey add sweetness, while cashews add creaminess. Then a bit of ground cloves adds a little interesting flavor, and a touch of salt mellows some of the bitterness and brings out sweetness. Makes ~2.5 cups: 1 medium or 2 small servings. If you use frozen mango you can skip the ice cubes and add more water. Blend on high* until smooth, ~45 seconds. I recommend eating a bit of kumquat while preparing the smoothie. 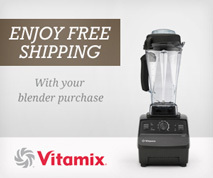 In addition to being tasty by itself, it will make the smoothie sweeter in comparison. Sweet, sour, flavorful . . . Yum! What other fruit can I use instead of a mango – I finally got the kumquats and bugger – I didn’t have any mango’s frozen or otherwise – that’ll teach me!! That’s a tough one because I think mangos are really well suited for this. Maybe pear? Peaches are out of season, but if you find some frozen ones, they might be good. Okay – I’ll run and get some frozen mango’s. I finally found some kumquats at the market, and was going to make this smoothie, but discovered I had no mangoes in the freezer…. so I substituted frozen persimmon, and it was wonderful! If you have any persimmons left, you should try it. So good!